What dominates everything is the devotion to the Madonna della Madia, the only patron saint of the town. 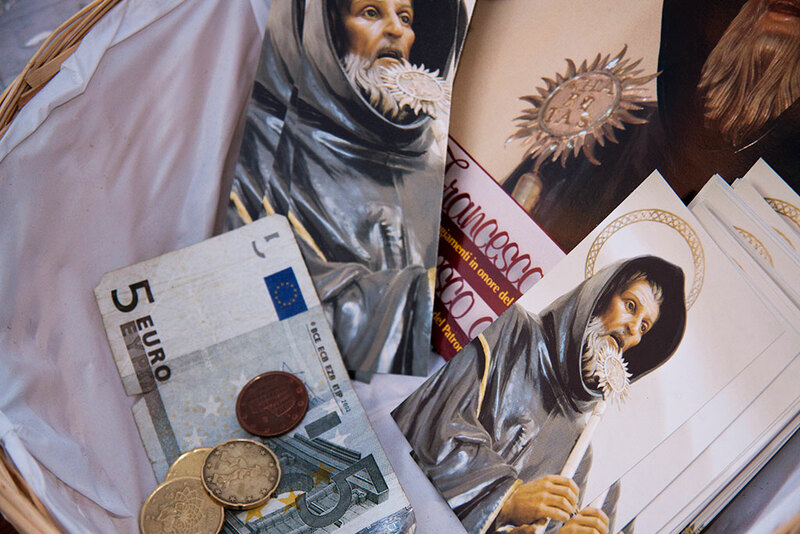 However, history and tales taken from ancient sources reveal how the devotion for San Francesco da Paola was also very important, and was the secondary patron saint and the current secondary protector. 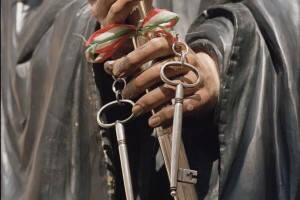 If you come in May, you will have the privilege of experiencing all the rituals of the month. In order to understand the present links between the Calabrian Venerable and the town of Monopoli, we have to go back 500 years. The figure of the charismatic Patriarch was introduced by some monks. In fact, in the 16th century monk Minimi came to Monopoli, driven by Padre Giuliano Genuese. He had an important task to fulfil: spreading the devotion for the Saint of Paola, the founder of the Order to which he belonged. Furthermore, he wanted to spread the devotion for him for regenerating the spirit of the citizens of Monopoli who were greatly affected by a series of ill-fated events. Still today, the human need to feel reassurance on earth pushes citizens to participate in the triduum of prayers, solemn masses and processions during the traditional feasts (normally celebrated in the first weekend of May). A common belief is still strong and deeply rooted: the saint according to his will can do anything. 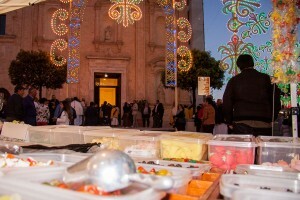 When the rituals of the Holy week, Easter and the seven Thursdays of the Holy Spirit (devotional pilgrimage for receiving the gifts of the Holy Spirit) end, the feast of San Francesco da Paola opens the cycle of the popular rituals which will take place during the summer and last until the autumn with countryside feasts. After the weekly triduum, held by the Fraternity of the Convent, the main events start on Saturday night with the solemn Eucharistic celebration. 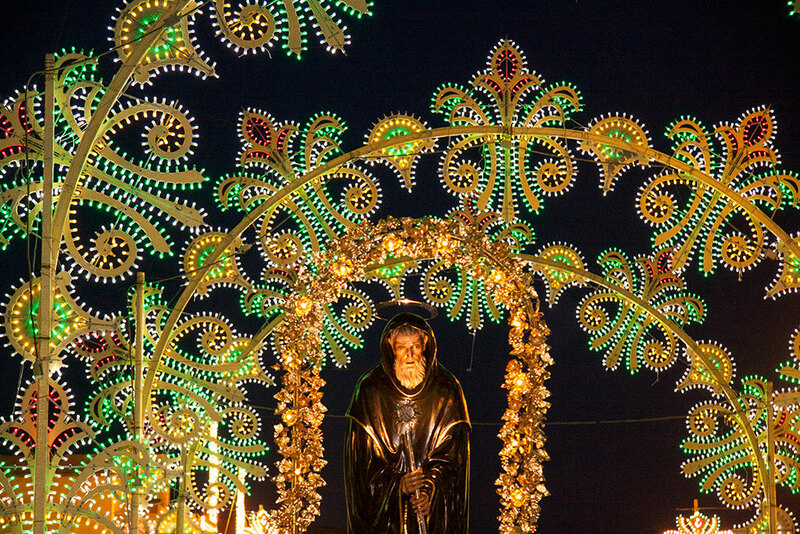 The gonfalon of the town stands out during the procession, a laical symbol around which the presence of the Order is focused, particularly for sailors, who have become more and more devoted to the saint over the years. 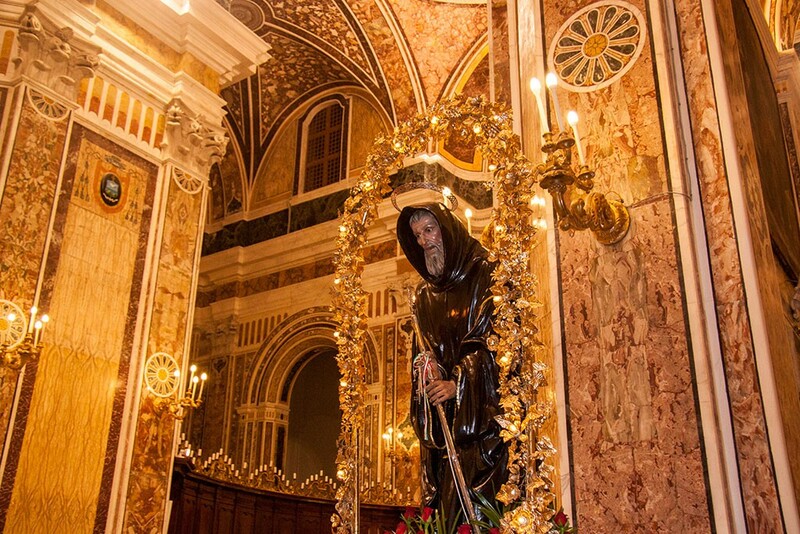 Other celebrations in his honour, the “reserved ones”, take place on the date of his death, the 2nd of April, when the community meets for his commemoration in a quieter atmosphere inside the church. However, it should be underlined that the public feast requires more complex organization because there is not the support of a congregation. The statue of the secondary patron saint goes through two lines of people, along the path of the central nave. The statue is later followed by a crowd of worshippers in prayer along the streets of the town towards the cathedral. As in the past, the statue is displayed to public veneration where all the worshippers can go and visit it. Along the way, other worshippers join the procession while a large number of people wait for the saint in piazza Manzoni, where there was once one of the gates of the town marking the boundary between the town and the country. 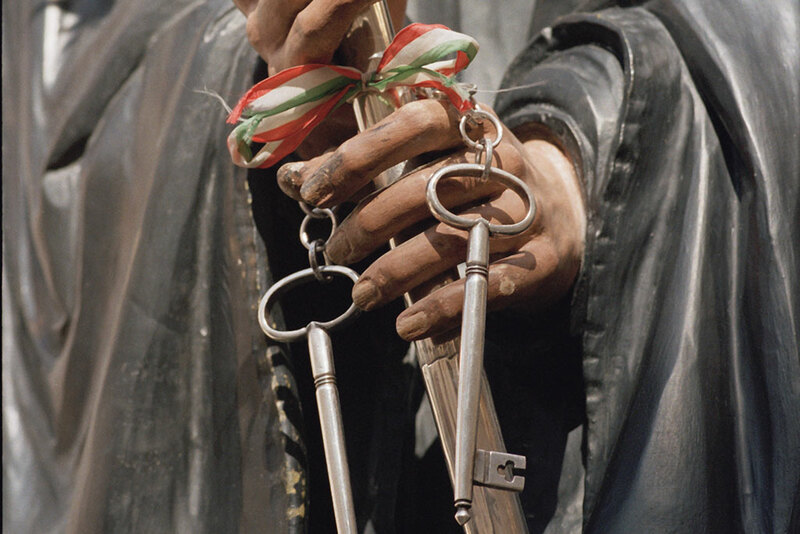 Here, in memory of the historical relationship between Paolotti and the University, the mayor, wearing his tricolour sash, gives the saint the key to the town relying on him for protection.